This text represents the working, pre-final-edit draft of the Strawberry Church as of March 2015. For reasons of formatting, it excludes relevant footnotes, which will be included in the printed version. See something that doesn't make sense? Have a question/ addition/ suggestion? Just let me know! After starting it up a couple of years ago, the strawberry patch in front of our kitchen window is now going like gangbusters. I was convinced, when I began the process of planting and growing them, that this wouldn’t be the case. Surely, they’d be wiped out by either my incompetence or some blight, devoured by rodents or nibbled away by ants. But what I’ve discovered is that strawberries are remarkably simple, robust and productive plants. They set in well. They spread on their own, spreading out on runners. And they produce. A little water, a little weeding, and that five-by-five square of stolid Virginia clay has been a veritable cornucopia of sweet and/or tart berries. So many, in fact, that the second year I grew them, for the first time in my existence, I spent a post-Sunday Monday morning making home-made strawberry jam. Yummy, yummy jam. A larger patch has gone in on the other side of the driveway, and though it's taken a hit or two from some burrowing critters, it's on the way towards producing a really rather nice yield come late summer. More jam will be forthcoming. I really enjoy growing strawberries, particularly when the tiny little cherub who lives next door comes over to check out how they are doing. "Hello, neighbor," he says, in his tiny little voice, and then wanders over for one of those conversations that make me wistful for when my own lads were that age. He's marveled at our blueberries, and squatted down and peered earnestly at the green beans, and looked at the riot of blackberry vines. But the strawberries? He loves those most of all. Sure, they're simple to grow, being a robust and unassuming little plant. But to a preschooler, for whom the world remains bright with magic, a bursting strawberry patch is an amazing, marvelous thing. 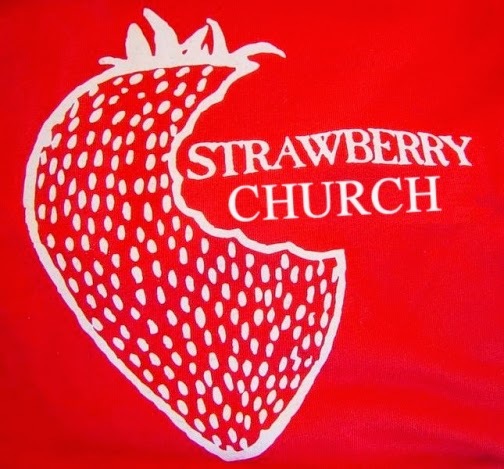 And so it was struck me, when I was first showing my little neighbor the first tiny budding green berries, that the strawberry is a particularly lovely metaphor for the kind of church I think I like the best. Strawberry plants are small, sweet, simple and good. They can thrive in a field, or in a little pot set out on the balcony of your apartment. And so the idea arose: what are we really looking for in a church? More often than not, we think we’re looking for something complex. We’re looking for programs and buildings, for perfect music and a silver-tongued preacher. Many of us may be looking for those things. But if we’re looking for something simple and gracious, spiritually nourishing and sweet to the soul, something that exists on a more human scale? What does such a church look like? What do we need to do to nurture and cultivate such a fruitful community? The rest of what you’re about to read is my best swing at answering that question.